HubSpot's website and landing pages can be password protected, giving you the ability to control who can see the content on a specific page. This is often useful when creating thank you pages and resource download pages. 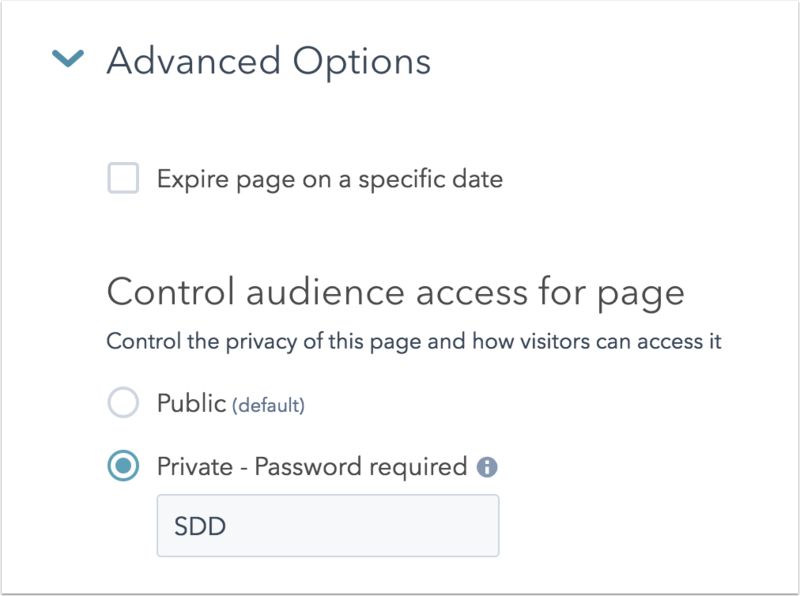 HubSpot Marketing Hub Enterprise uses can use the CMS membership feature to assign audience access to specific HubSpot lists. Please note: enabling this feature on a page will only require a password to enter the individual page. If you have links to other HubSpot pages on the protected page, those links will be accessible without a password unless you have also password protected those pages. In your HubSpot account, navigate to landing pages or website pages. Hover over the page you want to password protect on the pages dashboard, then click Edit. Click the Settings tab and then click to expand Advanced Options. Select the checkbox option for Require a password to view the page, then enter a password in the box. Click Update or Publish to take your changes live. The page will now require users to enter a password in order to view the page's content. Please note: this password protection doesn't provide any kind of encryption and shouldn't be used in place of user accounts or to hide sensitive data. Additionally, pages that are password protected via HubSpot are unable to be crawled by search engines.